Its about a theory before the walls considering what Eren's dad did to Eren with the injection. liala wrote: Well, we don't now for sure yet but it is heavily implied that he really ate his dad. That was the leaked ending stuff then? 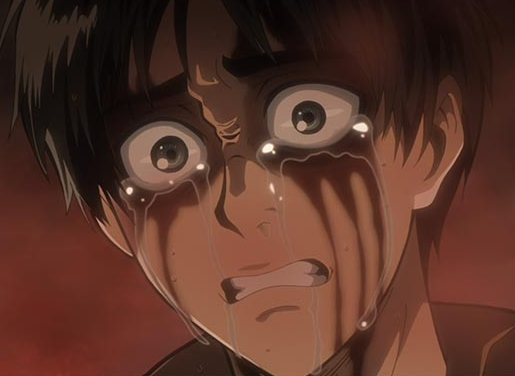 Maybe it is not the same anymore because Isayama said he changed it for the fans or something. So maybe you get some suprises. I'm also guessing it has something to do with the government. They obviously have something to hide and get rid of everyone who stands in their way. Like in this chapter. Is that really the ending or just a theory? Last edited by TheGreatJedi on Wed Jun 04, 2014 12:56 pm, edited 1 time in total. Yup that's the ending i've been mentioning all this time.You did a stupid thing posting it here though.So i'm gonna edit it out this time and let it slide.Next time i wont be so lenient. Well if that's the full story line, then it isn't really what id image. I've read about it before but I though it was fake for the reason it didn't seem very Shingeki no kyojin-ish. To be honest I don't really believe that's the real story line. It was leaked by a assistance/manger. Yeah.. I don't think so. Eh too bad I read a bit of it too because it wasn't marked in spoilers before. But I think so, too Rasco. I don't believe it untill it really happens. Maybe Isayama was a huge troll and it was leaked on purpose. I'm wondering why the history of the walls never recorded about titan shifter ? and why attack humanity now when they have 100 years chance to do it.I think the king is hiding something Incredibly Big. It was probably to wait until humanity's guard was down. Humanity underestimated the Titans and so it was horribly shocking to see the colossal Berthodlt.